When you think of Epyx on the Nintendo Entertainment System, what’s the first title that comes to mind? California Games no doubt, a bona fide classic summer sport mix. But how many think of World Games? Does this collection, ported by Rare, belong in the same breath? 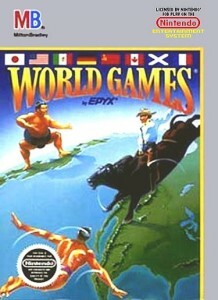 The eight events contained in World Games are Weight Lifting, Barrel Jumping, Cliff Diving, Slalom Skiing, Log Rolling, Bull Riding, Caber Toss, and Sumo Wrestling. As you can see these are all quite unique sports, helping World Games to stand out as something different. In a lot of ways this selection trumps the actual gameplay. Like a number of collections, it’s uneven. A large part of this discrepancy are the controls, which aren’t intuitive for many of these games. You’re sure to want a manual or Faq on hand. You can practice individual sports, which is nice and something of a necessity. While certain ones emphasize button combos, the bulk rely more on timing. Once you get a feel for each event it’s not overly hard to set world records on many, although with no battery backup they disappear when the console is switched off. My favorite event is the Barrel Jumping. Slalom and bull riding are my least favorites (counterintuitive) with the rest being middle of the road. A travelogue is included so you can learn a bit about each sport. I rather like this inclusion, as it gives the game background flavor with almost Carmen Sandiego like fact sheets. For instance did you know that Barrel Jumping is an over 300 year old sport, with jumpers hitting speeds of over 40 mph? Or that to enter Sumo apprenticeship, Japanese boys must weigh at least 160 lbs by age 13? Graphics are commendable for such an old title. There are lots of fun little animations and touches. 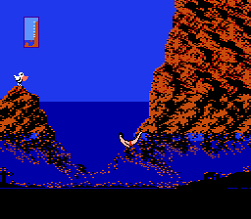 The character’s face turning red if the barbell’s held too long, or bouncing off rocks and belly flopping into the water. There’s no music during the actual events, but a unique piece opens each sport, reflecting the game’s origins. The bagpipe number introducing the caber toss event is strong. When playing Log Rolling, you get to hear the Lumberjack song from Monty Python! Grab a retro minded buddy or two and you’ll have some fun with World Games, at least for a little bit. Ultimately what will keep this game in your collection is just how odd some of these events are. They make this title just interesting enough to warrant some of your nostalgic attention. Grab a retro minded buddy or two and you’ll have some fun with World Games, at least for a little bit.